Today was our full day in Guanajuato and I can already say that it isn't enough. This city is amazing and beautiful, the people are friendly, and the food has been fantastic. We started the day with a light breakfast of fruit, toast, and cereal and then got ourselves ready to meet with our guide. Alex met us in the lobby of our hotel early and we set off on our walking tour. The first stop was the basilica across the street. Guanajuato has no cathedral, he explained, because there isn't a bishopric in this city. That is not to say it isn't an important religious site, Pope Benedict visited a few years ago and stayed about a block away from our hotel. He then took us to the university which was founded by Jesuits in the 16th century and after that he talked at length about the school's recent history and my mind started to wander. I did get to wondering if we should redirect him towards the topics that hold interested to us but it was hard to find an opening. Alex told us about the mineral wealth, mostly gold and silver, and how this was the jewel of the Spanish empire in Mexico. 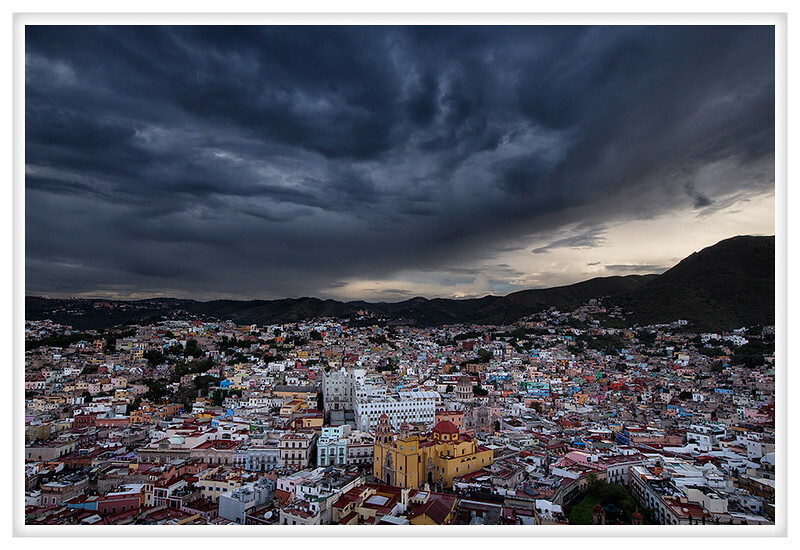 The name Guanajuato is derived from the native words for "hills of frogs" because of the shape and color of the mountains surrounding the city. I suppose it is a trait that could have be observed in the past but it isn't obvious now. Sadly there is no connection to real frogs but the climate is probably too dry for that even if there used to be natural rivers cutting through the settlement. We explored some of the tunnels, saw the museum to Cervantes and the statutes of Don Quixote and Sancho Panza. In October they have a three week festival dedicated to Cervantes which we just missed but which was described as rather overwhelming. Apparently Guanajuato's sister city is Ashland, Oregon where they have the Shakespeare festival for ten months out of the year. Finally we circled around to see Guanajuato's mummies. The high mineral content in the water here coupled with the used of catacombs due to the rocky soil has led to natural mummification. A tax on burial plots has forced the eviction of some tenants and of those a fraction have been put on display in their museum. It is a rather macabre collection of people with a fairly mixed representation. There is a man who died of a stab wound where you can see the wound and the staining of the tissue surrounding, a woman who died with her unborn child both displayed together, a number of people of European descent, a Chinese woman, and a number of children and infants, one of which looks as though it was autopsied. I may share a few pictures eventually but they might be rather disturbing for most. Although one young boy who couldn't have been much more than three years old excitedly pointed out all the babies to his family so I guess it isn't upsetting for everyone. It was getting into the afternoon and we decided lunch was in order. We looked at a couple menus and when I found one with something acceptable I was ready regardless of the quality. Fortunately the food turned out to be excellent, I had the fish tacos and I don't think it is the hunger speaking we I say they were the best I've ever tasted. Once we paid our bill Francene did a little shopping and then we stopped off for gelato at a different place where it was not only cheaper but better too! We then retired to our hotel for a little relaxation before heading out again to take the funicular to the best viewpoint in the city. It was raining but by the time we got to the top the thunder had stopped and the rain lightened to a mist. Once we had taken our pictures we were ready for a light dinner but there wasn't must to speak of by way of food up there so we walked down the steep winding stairs into town and one of the first places we came to was a well-review Italian restaurant. I had the pizza because I have had a little too much fish recently and it was quite tasty. Francene and Araceli both raved about their food; I think it was polenta and enchiladas respectively. Full again we stopped off for some Mexican candies, some bottled water, and just a little more gelato before retiring for the night. Tomorrow we are on the road again; although I generally prefer to stay put a bit this has been a lot of fun so far, I am just so happy to be away from Puerto Vallarta, it is not my kind of travel at all.